Venice is one of the iconic cities of Italy, surpassing even Rome itself in its unrivalled romantic atmosphere of sighing bridges, meandering canals, crumbling palazzos and operatic gondoliers. It’s a great city for family as well as romantic breaks, and in February the weather here is recovering from its winter unpredictability and you’ll be just in time for the start of the incomparable Carnival season. Venice is one city you really must see before you shuffle off your mortal coil, and this is the best time to go there. The famous Venice Carnival takes place all over the city over twelve days, starting a couple of weeks before Ash Wednesday each year and centred on the historic Piazza San Marco. Everybody dresses up in some way, usually in a baroque style reminiscent of Phantom of the Opera. 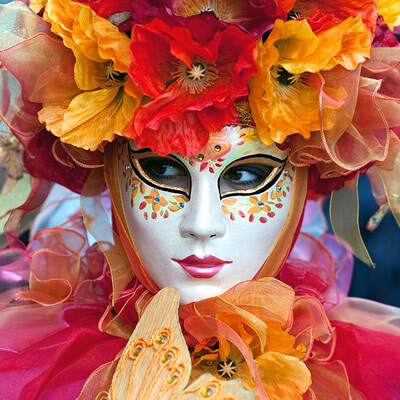 It has its roots in the universal pagan celebrations to mark the onset of spring, but this carnival is the elegant and decadent daddy of them all. There’s a grand procession through the city to start it off, followed by jousts and other entertainments before the grand climax in a rota of palaces, called the Doge’s Masked Ball, which anyone can get into if they have suitable dress and can do a neat 18th century quadrille or two. The end of festivities is marked by another stately, masked procession along the Grand Canal. Venice is a city of grand palaces that often look as if they’re on the point of sliding into the canals they stand on, and they’re certainly picturesque enough. The great Doge’s Palace is the most famous and one of the oldest in the city. Now a museum, you can wander around it and see how the Doge and his inner circle ran this amazing city for close on a millennium. You can even take a look at a darker side of Venice in the prisons and torture chambers under the palace on a fascinating Secret Itineraries tour. This Byzantine masterpiece that stands right next door to the great palace of the Doge is stuffed with priceless treasures including glistening ancient mosaics and paintings by the pick of Italy’s artists. This is the most iconic bridge in Venice and probably the most famous in the world. It dates back to the late 16th century and is extremely elegant as well as functional, with its central pinnacle convenient for lookout duty in the past, when Venice was constantly involved in trade wars. There are shops and markets under its arcades and it’s the perfect vantage point for watching gondolas pass below. For culture vultures with a penchant for modern art, the Peggy Guggenheim Collection in Venice is an absolute must. It’s Italy’s most important modern art collection, housed on the Grand Canal in an 18th century palace and including works by the likes of Jackson Pollock, Picasso, Alexander Calder and numerous other big names.